The Paralympics often serve as a platform for joy and heartache, but rarely for heart-to-heart connections across national boundaries that result in true love. 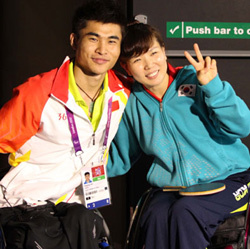 However, such was the case in London recently as Korean paddler Moon Sung-hye, 34, who won two bronze medals at the Games, announced she is in a relationship with 25-year-old Chinese table tennis Paralympian Cao Ningning. Cao collected one gold and one silver medal in the British capital -- but will soon add another prize as the pair revealed they will wed soon. The two athletes, both of whom are wheelchair-bound, first met at a party held on the sidelines of the 2007 Slovakia Open in Europe. Cao reportedly approached Moon and told her he had been cheering for her at the previous year's Asian Paralympic Games in Kuala Lumpur. They became firm friends and Moon visited him in the Chinese capital last year. "Ningning invited me to Beijing and he treated me as if I were a princess. I realized how warm-hearted he is when he cried after seeing me fall over on the street," said Moon. Moon revisited him in Beijing later last year while she was there for training, and the couple confirmed their feelings for each other. They initially communicated in English, but Moon has since learned basic Mandarin so they can chat more comfortably. The two have yet to pick a date on which they will tie the knot, but they expect to hold ceremonies in both countries.